Unless you are an Afghan citizen, you will need a visa to visit Afghanistan. The only exemptions are travellers born in Afghanistan, born to Afghan parents or with parents born in Afghanistan, and people with service or diplomatic passports of select countries. The Afghanistan tourist visa is valid for 30 days. It’s single entry. It is not date-specific, meaning the visa duration starts from the day you enter, which can be any day within a 3-month period stated on the visa. Visitors must hold a passport valid for 6 months from the date of arrival except for citizens of Australia, Belgium, Bulgaria, Canada, China, Czech Republic, Denmark, Egypt, Finland, France, Germany, Hungary,India, Indonesia, Iran, Iraq, Italy, Japan, Kazakhstan, Kyrgyzstan, Netherlands, New Zealand, Norway, Pakistan, Poland, Romania, Russia, Saudi Arabia, South Korea, Spain, Sweden, Tajikistan, Turkey, Turkmenistan, United Kingdom, United States and Uzbekistan as well as all foreigners of Afghan origin, whose passports only have to be valid on arrival. Certain embassies ask for a letter of invitation, while others don’t. Some embassies don’t issue tourist visas at all due to safety concerns. Who does and who does not changes often. Did the embassy not ask for a letter of invitation this week? Next week they might. There are no hard and fast rules as to the application process. Each ambassador decides for himself. And ambassadors, it turns out, are a fickle species. If you need a letter of invitation, you can get one from a local in Afghanistan. Couchsurfing is full of helpful people. Tour operators do not want to give you a letter of invitation unless you go on a tour with them. Do you need to register when you arrive in Afghanistan? Yes and no. Officially yes, but enforcement is lax. Foreigners can get hassled though (and have to cough up a bribe) when they leave Afghanistan if they don’t have a foreigner registration card, or even on the street by police. So best to get one. When you arrive, you are meant to register within 48h (preferably 12) and be given a foreigner registration card free of charge. Make sure you bring passport photos with you – take 2 to be sure. In Kabul airport, you get your registration card from a desk in the baggage area. If you arrive early or late or on the weekend, though, the desk will be closed. You can then opt to stop caring and say when you leave the country that the desk was closed when you arrived. Or, you can return to the airport later. Or, you can head to the police headquarters or the ministry of internal affairs. October 2015: Airport registration closed, went to the police headquarters with the hotel receptionist. 2013: Went back to the airport later in the trip to register. The registration officials (who, this time, had bothered to turn up) gave me a hard time because I hadn’t registered within 48 hours of arriving. I just kept repeating that the office was closed when I arrived, ignored what I later realized were probably half-hearted attempts at a shakedown for some moolah, and eventually emerged with my registration card. As it turned out, I wasn’t asked to turn it over when I left the country. July 2012: Crossed at Termez, no registration necessary. There is no transit area in Kabul airport. If you are transiting there, you will need to apply for a transit visa at the Afghan embassy. There is no multiple-entry visa for Afghanistan. Questions and reports with regards to multiple entries to Afghanistan are welcome in the multiple-entry forum thread. If you want to visit the Wakhan corridor you need a special permit. All info in the Wakhan corridor travel guide. The border market closes when there are problems. In the past, these have included Taliban attacks, cholera outbreaks and mudslides. Updates on the Ishkashim border market are posted in this forum post. A tourist visa to Afghanistan can be extended only once, for 1 month. The cost for overstaying your visa is now $10 per day overstaying during the first month (instead of $2 per day previously), and $15 per day for the second month (previously $5 per day). If the delay is more than two months, in addition to the fine, you will be deported. August 2015: It has become quite difficult to apply for a visa extension in Kabul due to security concerns. However, it’s still possible. First, go to the Ministry of Culture and Information, last floor, ask for a letter for extending your tourist visa, very friendly people. (Don’t go to the Ministry of Foreign Affairs, it’s only for business visa) Then, go to the Afghan Tourism Organization (ATO), next to the National Gallery, a few hundred meters away, give them the letter, a color photocopy of your passport details and Afghan visa, one recent photo, and a reference letter from the guesthouse or hotel you’re staying in.They will give you an application form to fill in and ask you to come back the following day with your passport and $10 (I paid 650 Afghanis) in exchange for another letter (previously asked $20). You then need to go to the Passport and Visa Office (PVO), quite far away, better take a taxi, the following day with that letter in order to get your visa extension. I went to the PVO and they asked me again for a letter from a guesthouse or hotel, a color photocopy of my passport details and Afghan visa, a recent photo, and the letter from the ATO. PVO is closed on Thursdays and Fridays. The same documents I already gave to the ATO. The cost of visa extension is $50. IMPORTANT: I mentioned I was staying with an Afghan person in his house through CS. They asked me for a reference letter from that person signed by himself and the police chief, and the owner of the house. I went to the ATO three times, but they wouldn’t do anything without the letter, and started to become very upset and annoyed. Simply go to a guesthouse (I stayed at Salsal Guesthouse, very good location, very friendly staff, for 700 Afghanis a night (about $11.50), stay one night there, ask for a receipt, and give it to the ATO person. It should work. 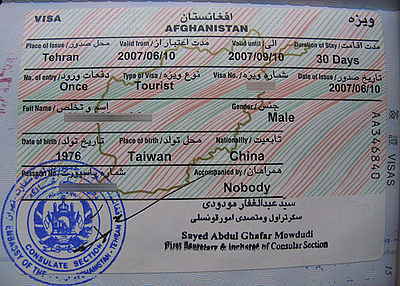 This type of visa can be obtained in Mazar-e Sharif, Kabul, and Herat. Pay $10 and get a letter. Then, go to the police station in front of the Blue Mosque on Qumandani Amniya Rd. First,you need to get a stamp from one of the commanders. His office is in the building facing toward the extrance.Go to the second floor and ask staff where he is. Second, take your letter to the building next to it with dark blue windows. Also go to the second floor to obtain application. In this step, you’ll have to hand in the color copies of passport and visa. Then they’ll tell you to take another copy and filled in application to passport and visa office. PVO in Herat is still inside of the police station. Normally,there will be a long queue and lots of people but ignore that, try to find a soldier to help you get inside. In the first room on the right hand side, the officer inside will give you a payment slip for the fines of expiry or the fee for the visa. Just go back to the corner of Qumandani Amniya Rd. and Jada Walayat Rd.,there’s the only Da Afghanistan Bank in Herat. Bring another slip from bank back to the office and the officer would tell you to pick up next day. Afghanistan’s embassies…in short, very unpredictable. One week it’s this, next week it’s something else. Keep it in mind: the information below is not a strict guide. Many people going to the Wakhan Valley via Tajikistan get their visa in Khorog. May 2018: refused. They asked for LOI, embassy letter and criminal record. May 2017: After difficulties obtaining visa in Bishkek, got a visa in Almaty without need for letters of embassies or ministries. March 2017: Needed a letter of invitation. New address since 2018: Go to Baitik Baatyr 3/2 and then through tunnel and you can see Hungary Embassy. Afghanistan new embassy is next one behind the fence. According to the sign, consular section reception hours are 9:30-12:00 and distribution hours are 14:00-15:00. “Reception days” are Tuesday and Thursday. The listed hours are flexible to some degree. The process involves filling in the form, handing in your passport and 2 passport pictures, and paying. Payments are made at the National Bank of Pakistan, located on the corner of Sovietskaya/Moskovskaya. Updates are collected here. May 2018: You will need letter from your embassy, but as I told there are no Estonian consulates in the area they agreed to give me visa after half an hour chat about Afghanistan problems. I told them that I will visit only Mazar and Balkh and wrote letter that I am aware of security situations. Paid 130 dollars in Pakistan bank and got my passport back next day. September 2016: The costs for a visa are $70 for Dutch (and other mainland EU) citizens, $120 for British citizens and $160 for American citizens. Express service is $50 extra. Make sure to come early if you wish to apply for express service. If you hand in your proof of payment on the day you apply, you can pick up the visa the next day., even if the embassy states it doesn’t operate on those days. June 2016: 1 Month tourist visas cost $160 for US Citizens (cheaper for everyone else). Normal processing time is approximately 9 days. Rush service is $50 extra for all nationalities, to be picked up the following afternoon. No letter from the MFA required, although it says so on a sign outside the gate.. Extremely smooth process. October 2015: 70$ for 7 days turnaround, 200$ for same-day. September 2015: Getting an Afghan visa in Bishkek is now both easy and quick again. 81$, same-day. May 2015: Afghan visa from Bishkek is now very difficult to obtain. The consul asks for an invitation approved by the Ministry of Foreign Affairs of Afghanistan – even for tourist visas. September 2014: 61usd, 3working days, 3month single entry 30days, Chinese passport. 1 photo, form, handshake with consul. September 2014: Easy same-day procedure, 81$ for New Zealander, 3 months validity, pay at the Pakistan Bank on the Corner of Sovietskaya/Moskovskaya. Updates collected in the Canberra embassy forum thread. Mailing in is possible. March 2019: Tourist visas for $120 AUD. Urgent application for an extra $75 (48 hours processing). To find the Embassy, take the metro to Al Jafiliya station, and get out at exit 2. Turn right, then go around the Immigration building (you will need to turn left to go around it). You will pass a building with a large ’4′ on it. Once past the car park, road 38B is just in front of you; the Embassy is approximately 200 metres along it on the right, just look for the Afghan flag flying above the building. You can get the application form at the embassy. You need to show your UAE visa. Prepare a copy of the first page of your passport and 1 passport-sized picture. The application fee is 50USD but they won’t accept US dollars, only Dubai currency. Updates collected here. April 2017: with letter of invitation, 1 day process. March 2017: letter of invitation needed. May 2013: 4 hours. Cost was 185 UAE Dirhams for a single entry 30 day tourist visa with a validity of three months. I used an Australian passport. You will need to bring your passport, a photocopy of the photo ID page, one passport photo and a LOI. Passport forms are available once you arrive. Location: take minibus #22 from next to the teachers college on Rudaki. Get off a couple of stops past the traffic circle with a ‘fountain’ that is really metal. It’s across from the German embassy. Updates in the Afghanistan embassy in Dushanbe topic. June 2018: 80USD/7 days or 130USD/3 days with a private invitation from a friend of mine in Kabul. I still got refused. The embassy doesn’t except private invitations, only official LOIs by Afghanistans ministry of interior. They also offer tourist visas if you hand in a letter of no objections. Of course the german embassy doesn’t issue those. June 2015: In Dushanbe they said the price of the visa issued in 1 day is 200usd. And you need support letter from your own embassy when applying visa. July 2012: no visa issued to women travelers at all, one woman reports. October 2011: American traveler paid $61 for an Afghan visa. Here is his insider tip. Right across from the new Afghan embassy, which is, incidentally, about diagonally across from the German embassy, there is an alley. Go into that alley and you will find a lady behind a desk under an awning of vines. Bring your photo and have your passport. She will do the entire paperwork for you for a few bucks. You will not get that at the embassy itself. I arrived without anything and was sent over there. After that you will be sent to a bank to pay, get a receipt, and return to the embassy. They then will tell you to come back two days later after lunch. Also keep in mind that they are closed Friday afternoon and Saturday and Sunday. September 2015: Normally applications can only be made in person, but as I live in Zurich and not Geneva they agreed to let me post it, though it had to be sent by registered mail. They told me to expect the visa within about a month from sending it (making me terribly grateful that I dealt with this well in advance). I sent my passport along with the application form, two passport photos (35×45 mm), my bank Statement proving I paid the visa fee (CHF 80), a colour copy of my residence Permit booklet, and a letter from my University stating the Duration and Motive of my stay. In short, it was the same rules as stated on the embassy’s website, except I did not have to travel to Geneva (which it says you do) and had to send my residence Permit (which is not listed). To my surprise, I got the letter with my passport and visa (single-entry, 30 days) only two weeks (even though they said a month) after sending the application. October 2018: No hassle. 7 days processing cost 80$, next day costs 130$. January 2017: You seem to need a 4-digit invitation code from Afghan MFA after a recommendation from someone living in Afghanistan to get a visa in Istanbul. November 2016: Very easy. The whole process took me slightly more than 1 hour without an LOI and without any prepared documents. They needed my itinerary, and asked me some security questions. Opening hours: The consulate in Khorog is open 5 days a week from 8 to 1-2 (“sometimes we close at 1:30, but we definitely won’t be here at 2”). No problem for lone female travelers to get a visa here anymore it seems. Updates in the Khorog consulate forum topic. October 2018: Australian, and Spanish paid $150, or $200 for express. No visa granted to other Australian who wanted to continue to Kabul instead of returning to Khorog after Wakhan Corridor. July 2018: US passport holder paid $220, plus $50 “urgent” fee to get it in an hour rather than two days. Afghan consulate in Khorog now specifies on the visa that you can ONLY go to Wahkan corridor. June 2018: 150USD/7 days without LOI or questions but there is no way to connect from Fayzabad to Kabul since Taliban action heavily increased around Kunduz and even within Badakhshan. Regular flights between Fauzabad and Kabul aren’t operating for years. September 2017: 150$ on the spot. August 2017: 200$ for Americans, same-day delivery. June 2017: “You have to go to Dushanbe.” ‘I don’t want to go there.” Ok, then, here’s your visa. 150$. June 2016: New Zealand – $150usd, Australia – $150usd, American – $200usd. Lady said prices have changed this month or last month.. Strictly no Japanese people can get visa in Khorog or maybe Tajikistan. Issued within a few hours went at 10am had by 11.30am. Need passport copy and photo and self penned letter but lady working there will tell you what to write. 30 Days given, Single entry. July 2015: It was extremely easy to get a one month visa single entry into Afghanistan, 3-month validity. Met with the consul, talked for a few minutes about my travel plans in Afghanistan, signed a letter stating that I’m fully responsible for my trip in the country, paid $50 at the mentioned bank, and got my visa right away. (French passport). September 2013: Polish citizen, 100 US$ same day or 50$ 5 days processing. June 2013: Visas can be processed in 24 hours. Cost is $100 for EU citizens, $200 for US citizens. April 2013: US Citizen = 200$, UK = 100$. This is the price for 3 day processing. 10$ extra to have it within 10 minutes. All visa updates collected here. Very fickle embassy. May or may not need an invitation letter depending on the day. January 2018: no invitation letter, 80$ for Malaysian, 3 day turnaround. March 2017: invitation letter needed. April 2013: The process is very easy. I arrived at 2.30pm, fill up the form at the office and give them all the documents (scanned passport copy, 2 photos, cover letter from employer, and my overland itinerary). The officer, Mr Haider was soooo friendly. He even gave me some contact numbers to call in case I face difficulties while in Afghanistan. The next morning, the visa is ready. RM350 (approx USD112) for a 30 days single entry visa (date on the visa is 3 months, u can enter at any time within the period) at a bank nearby the office, came back to show the officer the receipt, and in 5 minutes, I got back my passport with the visa in it. Updates in the Istanbul consulate forum topic. July 2018: No MFA code or LOI were requested. The visa cost for 1 week processing is US$80 and for next day is US$130. The officials were very friendly and the process was easy. September 2015: A LOI from a tour operator is no longer necessary. You can write a letter yourself with your itinerary and reasons for going to Afghanistan. June 2013: Nowadays the embassy asks for a LOI. It can be from an Afghan tour company. March 2011: Becky Coles, a master of Central Asia visa planning, got an Afghani tourist visa for 70£, 5 working days processing time. The embassy website says that you need utility bills to prove your UK address, but this is no longer true. A letter from your employer or place of study is now required instead. March 2012: At the moment it is not possible to get an Afghan tourist visa in Mumbai. March 2017: a letter of invitation is required. 2012: Apparently, it is no longer possible to get an Afghan tourist visa in Peshawar. August 2010: British citizen got a tourist visa for 30$. Processing time: 2 hours. Updates collected in the Afghanistan embassy in Prague topic. Drop in anytime between 9am and 2pm! June 2018: 8-day turnaround, 80 euro. The week after, no more visas! June 2017: 5-day turnaround, 80 euro. March 2012: New Delhi does not issue tourist visas for Afghanistan anymore unless the tour operator gets permission. December 2013: Started issuing tourist visas to foreigners again. From a Taiwanese traveler: travelers need to get the visa for next country after Afghanistan(I didn’t have then(Iran) so I said I could fly to Istanbul with e-visa) or the hotel reservation (how long you book,how long your visa is). I made the latter and paid US$101 for visa. One day process and got visa in the afternoon. No banks involved. June 2013: Only issues visas to residents of Uzbekistan. January 2013: Went to the embassy this morning, filled the form and got a little interview with the officials, said I will go to Mazar-e Sharif then Kabul and after this fly home, I told them about a contact in Kabul which I really have. Everything seemed okay but they asked me for “one last document” : EITHER hotels reservations OR a formal letter from my contact in Kabul to certify he really exist, lives in Kabul and know me. September 2012: 81$, 24 hours processing. Some questions are asked, best to not say anything to adventurous and list a contact. You need a copy of you passport and Uzbek visa, passport photo and 81$. March 2011: A Danish citizen got a tourist visa for 81$. For directions on the location of the embassy, see his post here. Updates posted here. Opening hours: approx 8 am – 4 pm (but slightly earlier some days) from Saturday to Wednesday. The embassy is located close to metro station Shahid Beheshti, and across the street are a cafe and a busy shop that fill out the farsi-only language application (for a fee of 100 000 rials), and gets it done in just a few minutes. They can also pay at the bank for you for another 100 000 rial. Bring a passport photo. Bank to pay is Bank Melli on Mirzae Shirazi Street (2nd floor), walking south from Motahari street one block away on the left side), second floor. GPS: 35.722541 51.416212. Closes at 1pm, so apply early if you want it done same-day. August 2018: A 6-month visa for Iran is now required to obtain a visa for Afghanistan. September 2017: I was told to come back the next morning at 10am which is apparently the best time and given the option of paying US$130 for same day or $80 for week long return. Luckily though for Australians (and judging from their heartfelt appreciative spiel, any other nation providing assistance to the Afghan government) the US$80 option will get you next day return. I provided a LOI that I received from a friendly host on couchsurfing and it did not seem necessary but may have helped. October 2016: Interview and blood test needed. Blood test done at Mehrad General Hospital (findable on google maps) a few blocks away on Mir Emad street (cross street 6th alley). Go inside the hospital, up to the 3rd floot, pay 1.200.000 rials (approx $37USD) and they will test you for HIV, HBS Ag, and HCV. 80$ visa fee. 10 days turnaround, but possible in 4 as well. You can pay for a rush service too if you like. Be aware they keep your passport for the entire time, and you cant exchange money (or buy a SIM card) in Tehran without a passport, so make sure you have enough money while waiting! October 2015: I didn’t need any letter from my embassy. The guy behind the desk was not really friendly and failed to help me. I had to comeback 4 times to show I was determined and then they became helpful. When I first came they asked me to go and register on a website, because the form I printed on the web was not correct. Problem is the website was entirely in Farsi. When I came back to tell them it was not possible to register it did not seem to impact them. I found a friend to help me then came back once again. There they send me to a shop on the other side of the street, where they helped to complete my application. I came back with the printed form, paid 60 euro for a two months visa. They asked me for a medical check-up, but some Iranians bargained for me not to have it. February 2015: I went to the Afghan embassy in Tehran and got a 60 days visa very easily, without LOI nor any letter from my embassy (Belgium). I paid 40 euros to get it in 3 days, but I could have had it in a few hours for 60 euros, said the very enthusiastic guy behind the desk. September 2018: quite easy, short conversation with the consul, show itinerary, hotel confirmation and letter of invitation and two weeks later we could pick up the visa (70 euro). The embassy is accredited to Japan, the Philippines and Singapore. The embassy is very good at responding to emails and you may send them your documents via courier after which they will ship it back to you via Fedex with charges billed to you. Updates in the Afghan embassy in Tokyo forum topic. March 2018: Pretty straightforward. No invitation letter was required, although you do require a heath certificate stating you are free from all infectious diseases. Cost of the tourist visa is 9,600 JPY (About 90 US Dollars) or 15,600 JPY for urgent processing. Business visas are a little cheaper. The visa is processed within about 4 days to a week. However, with regards to payment, the ONLY method of payment accepted is via bank transfer to the embassy’s Japanese bank account. NO cash or online payment is accepted. You make the payment after you send in your documents and the visa has been “provisionally approved”, following which you send them proof of payment via email and they will process your visa. May 2017: It’s now pretty easy to get afghan visas from Washington DC – they do not require a letter of invitation at the moment.